Click download for full size! You do realize that hawks and eagle are no longer falconids? Very well done, even if "Falconiformes", "Ciconiiformes" and "Pelecaniformes" as you use them are almost certainly not monophyletic. So much birds! I like the birds of prey, include the Old world vulture, the eagle, and the falcon! But the New World vultures were strongly resembled the Old World vultures, but they weren't closely related to. Sorry to bug you. I love hawk and falcon. Wow, this is amazing! but *nitpicky* the 'longest wingspan in the world' thing is inaccurate. The Wandering Albatross has the longest wingspan- 8 ft 3 in to 11 ft 6 in. Sorry to bug you! I really like your tutorials. They are nice just to look at. I like your website, too. If you don't mind, I'd like to ask: How has Lulu.com has worked out for you? I read how to upload something there. I wasn't sure if it was worth it to try one small book on SketchUp. I see that you have a number of really good items up there; so, even if you make only a little bit of money on one item, you probably sell a lot of them. Lulu is fantastic for me. It's a really good thing. Of course it depends on how much audience you have, but you really lose nothing having a book up there, some end up listed on amazon, and you can also offer ebooks up there. Have a good day, Cederseed! 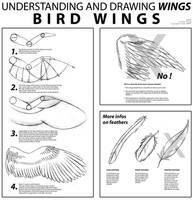 i am most definantly going to find this very helpful in drawing my birds! All of your tutorials are probably the most helpful ones I've seen on dA! I thank you immensely for uploading them! Thanks so much for these tutorials, immensely helpful! Hehe thanks for appreciating what an impossible task that would be! All 3 birds tutorials are excellent piece of work!!! Yup, there was a definite lack of these Enjoy!